Robert L. Pluemer passed away on Tuesday, March 6, 2018. Robert was born in Potosi, WI to Leo Pluemer and Rose Friesen. They moved to Faribault and Robert attended Faribault High School and graduated in 1940. 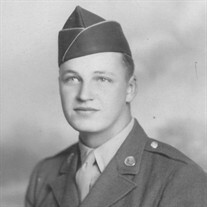 He enlisted in the U.S. Army and served in the European theater during World War II. He returned to Faribault and established a public accounting and tax consultant service. He married Mary Lou Karp and is survived by her and: Kim (Dave) Bongers, Dixean Drager (Rob Bigelow), Brian (Julie) Pluemer, Bruce Pluemer and Blake (Kay) Pluemer; by 10 grandchildren, Brent Bongers, Brad Bongers, Brittany (Logan) Kocian, Michael Drager, William Drager, Rachel Pluemer, Jenna Pluemer, 1st Lt. Paige Pluemer, Blake Pluemer Jr. and Cadet Pierce Pluemer; by great granddaughter, Eloise Kocian; by sister-in-law, Dorothea Pluemer; by former son-in-law, Harry Drager and by nieces and nephews. Funeral services will be held on Saturday, March 17, 2018 at 11:00 am at the Parker Kohl Funeral Home & Crematory. Interment will be held at the Maple Lawn Cemetery with military honors provided by the Rice County Central Veterans Organization. Visitation will be held on Saturday from 9:00 to 11:00 am.